It’s the ninth show in our series called, The Hero’s Guide to Winning Back Your Wife! It is the final show (until Seth reminds me that we need to do a wrap-up show) of the series. Last show we had to walk you through the possibility that your wife won’t come back. This week we get to give you the most important things you need to do if she does come back. This is going to be way more positive…which always makes me happy. And, you’re going to learn exactly what you have to do each day, each week, and each year moving forward so your relationship continues to get better. If you want to listen to all the episodes in this series, just click here. You’ve taken all the things we’ve encouraged you to do, and it’s worked! It’s the eighth show of our series, The Hero’s Guide to Winning Back Your Wife. Sometimes, the hero’s journey doesn’t have a hollywood ending. It can be more like the ending of Cold Mountain with Jude Law and Nicole Kidman. This movie came out in 2003 and I’m still angry and distraught about how it ended. You don’t want to hear today’s show, I know this, but you need to listen because what do you do if she doesn’t come back? You need to hear this because, unfortunately, it is a possibility. First, realize you have no control over whether or not you win back your wife. That is in God’s hands. We’ve landed on the seventh week in our series, The Hero’s Guide to Winning Back Your Wife. Today’s show could possibly be the most important of the entire series because you are going to learn the one question you have to ask. If you don’t ask this question, you’ll likely lose your wife. If you ask the question, and don’t follow through…well…let’s just say your hero’s journey could be over for sure. What could possibly cause you not to follow through? What if your wife reacts poorly? Just exactly what were you expecting? Does not matter what you think or believe, because her feelings are her feelings...which makes them a reality regardless of truth or facts. Validation is not agreeing, it’s simply allowing your wife to be who she is, faults and all. You’ve blown it, now what? Rocky 3 is a great example of humility. James 4:6: "God opposes the proud, but gives grace to the humble." Humility is getting back on God’s side. Stop telling her how you’ve changed and you’re a new man...show her! If her heart is closed, the last thing you can do is close your heart. 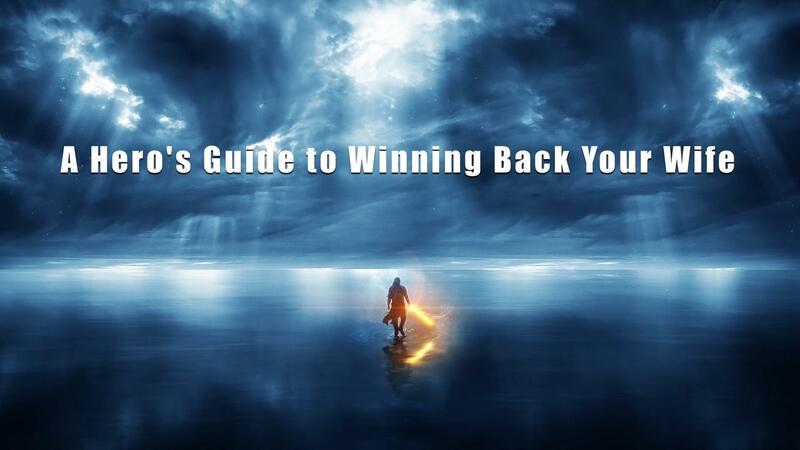 Today we start a special series on The Hero’s Guide To Winning Back Your Wife. It’s based on a new book I’m writing with my brother-in-law Roger Gibson for men who want to build the marriage of their dreams.